The Safer Roads Foundation, who are closely affiliated with ETSC and PACTS (The Parliamentary Advisory Council for Transport Safety) – has made a video which claims that motorcyclists are seriously injured or killed because drivers are simply unaware of our presence on the road and simply failing to see us. Their view is that the answer is simple, if ALL motorcycles are obliged under law to have their headlights on then there will be far less collisions with other vehicles. In our opinion the purpose of this video is to promote legislation for mandatory headlights on for all motorcycles, to give the motorcycle industry an opportunity of reducing the competition from the influx of cheap motorcycles mainly from the Far East that do not have AHO. 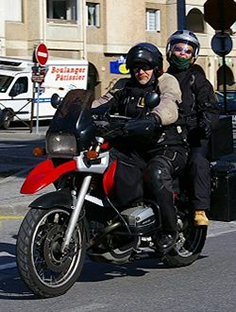 The members of the motorcycle industry representative body in Europe ACEM have since 2003 introduced a voluntary agreement for (AHO) Automatic Headlight On – there is no switch for a rider to turn off their headlight – for all models of Powered Two Wheelers, so that all motorcycles manufactured since then, headlights are already switched on while other drivers still fail to see us. The narrator further states that, “increased conspicuity will reduce PTW accidents”, but what she fails to mention is that there is a plethora of other research which debunks the whole debate. We know that there is a major issue with car drivers not looking. We know that there is a volume of studies that have identified driver inattention as a major cause of collisions with motorcycles, not the conspicuity of motorcycles. Comparisons between DRL and non DRL countries have demonstrated that there is no difference in the reduction of casualties over a 15 year period. The MAIDS (In Depth Investigation of Motorcycle Accident) report in 2005, states that “one third of motorcycle accidents are linked directly to the lack of conspicuity” and that, “three quarters of accidents involving cars and motorcycles are caused by a perception error on part of the car driver”. One of the findings from the MAIDS report was that headlights helped to save lives, which is now the mantra of the ETSC. However what the industry didn’t say was that the MAIDS study could not determine whether headlights on actually made a difference. What infuriates us about this video is that they are trying to bypass national legislation by using UNECE (United Nations Economic Commission for Europe) specifications which clearly defines the technical criteria for AHO (that already exists) to get around their “problem” and for the EU to define a directive around these specifications and thus introduce legislation for the mandatory AHO into member states. In fact the ETSC representative says, “All that is required is the simple modification of one single article of the existing legislation and that is something that can be done within a matter of weeks”. Well there goes democracy and the opinion of riders across the EU out the window! While the motorcycle industry opposes a legislative approach for the mandatory fitting of ABS brakes on motorcycles, because they are voluntarily fitting these to motorcycles, arguing that, “By 2015, 75% of street models will be offered with an advanced braking system as an option” and a legislative approach, “would be detrimental to the variety of systems, potentially freezing innovation”, they along with ETSC want to incorporate AHO as standard by compulsion on all motorcycles in the European Union. The other reasoning given for the introduction of mandatory AHO is that because legislation for Dedicated Running Lights (diode lights) will become mandatory for cars and light vans in 2011, then according to ETSC, this will increase collisions. In this instance, they have got it totally wrong, because they talk about Daytime Running Lights – but that’s not the case – the legislation will oblige cars and vans to use dedicated (diode) lights on all the time (not dipped beam headlights), while the majority of motorcycles are hard wired with (dipped beam) headlights on. 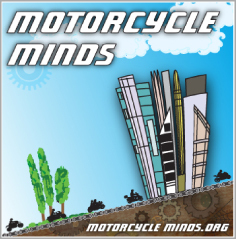 Whether you agree with us that mandatory AHO for all motorcycles will or will not decrease motorcycle collisions, or agree with the scare mongering of ETSC, the fact remains that the motorcycle industry is trying to have its cake and eat it too. This call to use UNECE specifications sets a dangerous precedent for future issues, that technical regulations already agreed in committee can form the basis for EU Directives on legislation which – according to ETSC can be modified in a couple of weeks without proper checks and balances. The Safer Roads Foundation is a non-profit organisation dedicated to the reduction of road casualties through: The implementation of engineering and other measures to improve safety on the highway. Working with public authorities and commercial organisations in the development of design standards affecting the safety of road users. Increasing public awareness of the issues affecting safety on the roads through education and promotion, working with other individuals and organisations with similar objectives. SRF is a member of: ETSC (European Transport Safety Council and The Parliamentary Advisory Council for Transport Safety (PACTS). The Parliamentary Advisory Council for Transport Safety (PACTS): is a registered charity and an associate Parliamentary Group. Its charitable objective is “To protect human life through the promotion of transport safety for the public benefit”. Its aim is to advise and inform members of the House of Commons and of the House of Lords on air, rail and road safety issues. It brings together safety professionals and legislators to identify research-based solutions to transport safety problems having regard to cost, effectiveness, achievability and acceptability. ETSC (European Transport Safety Council) – is a Brussels-based independent non-profitmaking organisation dedicated to the reduction of the number and severity of transport crash injuries in Europe. Founded in 1993, ETSC provides an impartial source of expert advice on transport safety matters to the European Commission, the European Parliament, and Member States. It maintains its independence through funding from a variety of sources including membership subscriptions, the European Commission, and public and private sector support for various activities. 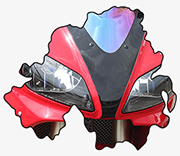 Why is it that the industry wants legislation on head lights for motorcycles? The answer’s simple – it’s because there is an influx of cheap motorcycles mainly from the far east that do not have AHO and ACEM doesn’t like that or more to the point, by pushing for legislation, the industry has an opportunity of reducing the competition. On page 99 of the MAIDS report, the teams indicated that “in 24.4% of the accidents collected, the headlamp was not in use at the time of the accident. In many cases, a switched off headlamp was likely to have been a contributing factor to accident causation”. Basically, the evaluators put their hands on the headlamps of the motorcycles to see if they were hot (or not) to determine whether the headlamp had been switched on. However the report continues “it was not possible to make a determination of whether or not the lack of headlamp usage had increased or decreased the risk of being in a PTW accident because the exposure data collection procedure involved an evaluation of PTWs that were refuelling and stopped at the time of the evaluation, and thus not riding”. Their other reasoning is that because legislation for dedicated running lights will become mandatory for cars and vans in 2011, then according to ETSC, this will increase collisions. (In this instance, they get it wrong because they talk about Daytime Running Lights – but that’s not the case – the legislation will oblige cars and vans to use dedicated lights on all the time). In the case of daytime running lights, there was a considerable amount of to-ing and fro-ing amongst the various lobbyists and as a result, the European Commission opted for ‘dedicated’ daytime running lights (diode lights) rather than dipped-beam headlights, in order to reduce road casualties. A small victory you might think, but not really because what became clear was that in spite of more than fifty studies on daytime lighting over thirty years, the case in favour of daytime running lights – of any type – is politically driven and still lacks sufficient evidence, due to the difficulties in achieving a reliable measurement of the effect of DRL.